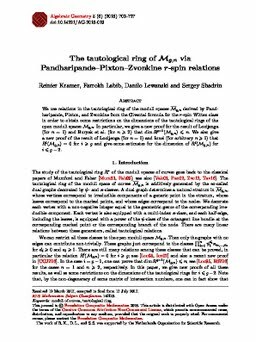 We use relations in the tautological ring of the moduli spaces Mg,n derived by Pandharipande, Pixton, and Zvonkine from the Givental formula for the r-spin Witten class in order to obtain some restrictions on the dimensions of the tautological rings of the open moduli spacesMg,n. In particular, we give a new proof for the result of Looijenga (for n = 1) and Buryak et al. (for n > 2) that dimRg-1(Mg,n) ≤ n. We also give a new proof of the result of Looijenga (for n = 1) and Ionel (for arbitrary n > 1) that Ri(Mg,n) = 0 for i > g and give some estimates for the dimension of Ri(Mg,n) for i ≤ g - 2.